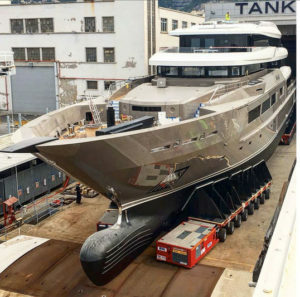 Tankoa latest and largest project to date, the 72-metre Project Solo also known as S701, is currently being completed in Genoa. Project Solo’s contract was signed and announced in late 2016, with expected construction time and delivery allowing for her première at the 2018 Monaco Yacht Show. Project Solo is much similar to her smaller sister, Tankoa’s successful 69-metre Suerte launched in 2015 while measuring 1,600 gt and displaying a different transom and a wide body upper deck. One of the stand-out features of the project is the strong emphasis on the owner’s desires in regards to the open plan layout. Italian world-renowned designer Francesco Paszkowski worked on the design of Project Solo, while Margherita Casprini took care of the custom interior spaces of the yacht. Some of the most remarkable features of the interior include a winter garden located on the main deck with a staircase down to beach deck on the port side. The side bulwarks on the main deck have been lowered and filled with glass panels, providing plenty of natural light to the main saloon. Accommodation onboard is provided across six staterooms including a master suite, a VIP stateroom and four guest cabins found on the lower deck. The opulent owners’ apartment is located forward on the 100-square-metre upper deck, offering an amazing 180° panoramic view on the surrounding seascape and linking to a private terrace and jacuzzi and aft to the certified helipad and second sun lounge area. Project Solo is capable of an impressive range of 6,000 nm when cruising at 12.5 knots and is expected to be able to reach a top speed of 17.5 knots on her sea trials, which will be taking place next month.